At about 04:00 (H M trawler Fraser, Skipper Alexander Geddes, with another skipper Francis John Williams also on board) is mined while in company with another minesweeping trawler Ben Gulvain, commanded by Skipper Alexander McLeod. The two vessels having already swept the entrances at Boulogne, the main route for all troop movements from England, and are on their way to sweep what is known as the Ridge when a mine is sighted. The Fraser, however, is destroyed by another mine which had been lurking unseen below the surface. Four of her crew are saved by the Ben Gulvain, but 13 officers and ratings are killed by the explosion. Lieutenant Colonel Thomas Robert Alexander Stannus DSO (commanding 4th Leinster Regiment) dies of wounds at age 47. He is a veteran of the South African War. Second Lieutenant William Horace Gordon Compton (Royal Field Artillery) is killed at age 24. His father will die at home serving as a Captain in the Royal Army Medical Corps in December 1918. Second Lieutenant Egerton Anson Frederick Corfield (Royal Field Artillery) is killed at age 29. His brother was killed in July of last year and they are sons of the Reverend Egerton Corfield Rector of Finchampstead Berks. Chaplain Frederick Canning Cleaver dies on active sersvice in the Middle East at age 37. Corporal Harry Hillas Haynes (North Lancashire Regiment) is killed in action at age 27. He is the son of the Reverend W B Haynes and had a brother who was killed on the first day of the Battle of the Somme. Private Alfred George Kent (Sherwood Foresters) dies of wounds at age 27. His brother will die of wounds in September of this year. 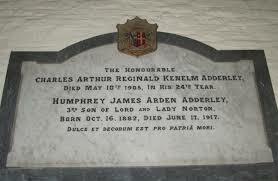 Rifleman ‘the Honorable’ Humphrey James Arden Adderley (London Regiment) dies of wounds at home at age 34. He is the son of Charles Leigh Adderley 2nd Baron Norton.